Photographic emulsion is a silver-based light sensitive material that can be applied to any surface, exposed by an enlarger and processing in conventional black and white chemistry. It is virtually the same emulsion found on ordinary photographic paper but in a liquid form and can allow the emulsion to be coated on a wide range of surfaces. 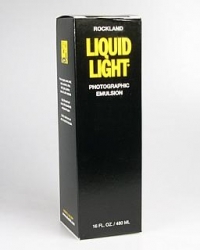 Use Rockland Liquid Light photographic emulsion for prints on wood, glass, ceramics, plastics, china, fabric, metal, rock, paper, artist's canvas, walls-- even an egg! Printing with Liquid Light is the same as with black-and-white enlargement paper. Under amber or red safelight, brush the emulsion onto a surface. Expose with an enlarger or slide projector. Process with standard paper developer and fixer. Prints are archivally-permanent with a full range of tones and transparent highlights that reveal the color and texture of the material underneath. Contrast is medium-high, about grade 3. Coverage is approximately 1.5 square feet per ounce. Rockland emulsions are non-flammable and odorless with no phenol or VOC's (volatile organic compounds) and are completely safe for use in darkrooms. Note: Rockland Liquid Light is safe under amber or red safelights but the emulsions needs to be handeled under dim safelights and minimize light contact during developing to avoid fogging the emulsion. 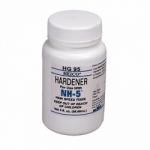 Heico Hardener for NH-5 Fixer for B&W Film and Paper - 3 oz.